Amazing - 3 colours on one standard plant. Three colours on one tree - pink, white and blue - selected to grow in balance for many years. Clever nurserymen have grafted 3 different colours onto one tree, instead of less successful plaiting. You will be rewarded with the Tricolour flower display in August and September. 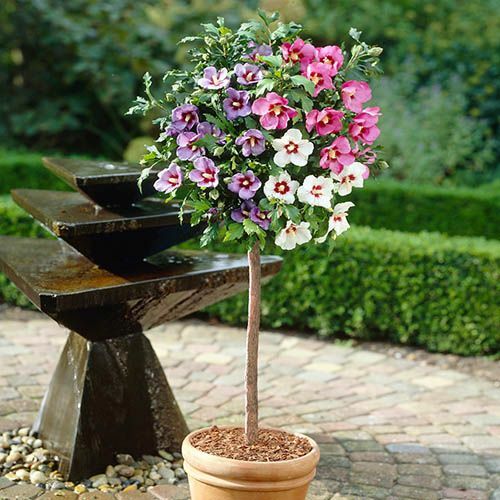 Supplied as a grafted tree 1.2-1.4m tall in 6L pot, ready to plant out. No, your eyes are not deceiving you - this amazing hardy Hibiscus standard tree actually does have 3 colours on the same tree, and will stay that way too. Hibiscus are often propagated by grafting, and the clever nurserymen have grafted 3 individual different colours - blue, pink and white - to the top of the standard stem. Usually they would graft 3 of the same colour, but in an experimental moment, created this delightful result. Quite cleverly, all 3 varieties have been selected carefully so they grow at similar rates, and no one colour will dominate the tree. This is a more reliable method than the sometimes offered 3 colours plaited together. All that your Hibiscus will need from you is an annual trim to shape, and they will stay in this lovely mix for years. Hibiscus syriacus is totally hardy in the UK, but thrives best in hot, sunny spots, and responds particularly well to heavy feeding, especially with a feed rich in trace elements. Flowering in August and September, prepare to amaze your friends and neighbours with this horticultural wonder! Supplied as a single plant 1.2-1.4m tall in a 6L pot with 3 colours grafted together. Feed weekly in spring and summer with a balanced feed with micronutrients.